West Ham recovered from conceding the earliest goal of the day to win a thrilling FA Cup tie at Upton Park. David Bentley tapped in the visitors' opener on 28 seconds but West Ham responded in fine style. 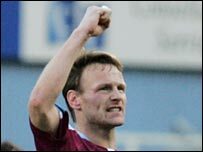 Teddy Sheringham equalised from the spot, Matthew Etherington slotted home the second and a Zurab Khizanishvili own goal saw the Hammers lead 3-1. Lucas Neil's fine curling effort made it 3-2 but Bobby Zamora's strike sealed West Ham's place in the fifth round. Blackburn eased ahead straight from the kick-off when Bentley had the easy task of toe-poking the ball past Shaka Hislop following Shefki Kuqi's centre. But West Ham responded in style. They equalised from the spot through Sheringham - following Khizanishvili's tug on Zamora just after the half-hour mark - and took the lead when Etherington drilled the ball past Brad Friedel from 12 yards four minutes later. Zamora wasted a great chance after the restart after he had been put through down the left-hand side by Nigel Reo-Coker. The former Spurs man had time to take the ball on but decided to shoot from just outside the box and saw it drift well wide of the goal. At the other end, Aaron Mokoena forced Shaka Hislop into a fine save when he let fly from 25 yards. But it was the hosts who marked their authority on the game by securing a two-goal cushion when Khizanishvili put through his own net from close-range following Paul Konchesky's centre on 59 minutes. Rovers boss Mark Hughes responded when full-back Neill sent a delightful shot into the top right-hand corner past Hislop to give the visitors hope. But Zamora restored West Ham's two-goal advantage on 73 minutes. Substitute Marlon Harewood has seen his low shot palmed away by Friedel only for Zamora to follow up from close range to slot the ball into the top of the net. ""I am blessed with luxury up there (in attack). Dean Ashton is definitely fit for Wednesday - so God knows what I am going to do! "Bobby carried it (the attack) for us in that first half. He was terrific. This is what competition does, it pushes people. "And what a terrific attitude Marlon showed after being left out of the team, to come on and put that effort in." Blackburn boss Mark Hughes: "It was a perfect start from the point of view of scoring after 30 seconds but West Ham got back into the game very quickly,"
"Our defending wasn't very good and we didn't give ourselves a chance. That is something we have prided ourselves on, but we have had three hard games in a row. "When you come to Upton Park you need to be on top form and as sharp as you can be and we weren't." West Ham: Hislop, Dailly, Ferdinand, Gabbidon, Konchesky, Benayoun (Fletcher 84), Mullins, Reo-Coker, Etherington, Sheringham (Harewood 71), Zamora (Katan 78). Subs Not Used: Bywater, Newton. Goals: Sheringham 33 pen, Etherington 37, Khizanishvili 59 og, Zamora 73. Blackburn: Friedel, Neill, Todd, Khizanishvili, Gray, Reid, Savage, Mokoena (Tugay 73), Pedersen, Kuqi (Emerton 60), Bentley (Johnson 60). Subs Not Used: Enckelman, Nelsen. Goals: Bentley 1, Neill 65. Ref: M Atkinson (W Yorkshire).